There are scores of programs these days aimed at helping you organize your tasks and projects. The most basic simply give you a place to list, and check off, your to-dos; the most complex have difficult learning curves and require you to master the program's intricacies before you can even start using it. Some are designed specifically for the Getting Things Done (GTD) system; others simply aim to take the place of a sheet of notebook paper. Wherever your needs fall along either spectrum, chances are you’re looking for something with a good interface and that ultimately helps you be more productive; Hog Bay Software’s TaskPaper 2.1 satisfies both requirements. TaskPaper’s most unique attribute is that it offers speed and dead-simple ease of use while still providing the essential formatting you need for tracking tasks and projects. There are no complex formatting buttons and menus: only a single pop-up menu for creating new projects (lists), tasks (items in a list), and notes (text notes within a list) in the current document. (You can also access these commands via the Entry menu in the menu bar or by using keyboard shortcuts.) You can create hierarchical entries using the tab key, and rearranging items is also easy: You move a task or note, and any sub-items, by dragging the item's bullet to a different location in your document. Alternatively, click anywhere in an item and then use the Move To Project command. TaskPaper also lets you add tags to projects, tasks, and notes. One such tag, @done, is used to designate a task, project, or note as complete; this tag can be added (or removed) by clicking on the bullet in front of an item or by using the Tag command. TaskPaper automatically “crosses out” any items with the @done tag. You can apply the other default tags, @today and @priority, to note items that you want to handle today or with high priority, respectively. And you can create your own tags to designate, for example, work and personal tasks. If you’re a GTD adherent, tags work well for contexts. What makes tags useful is that you can click on any tag, or use the Navigation pop-up menu, to display just those items with a particular tag. So, for example, you can quickly view just completed tasks (@done), all tasks to be completed today (@today), or all work-related tasks and notes (@work). If you want to hide completed tasks, an Archive Done Tasks command creates a new project in the current document and moves all completed tasks to it. Conveniently, TaskPaper adds the name of each task’s original project as a tag so you’ll know where it came from. If an item ends in a colon (:), it automatically becomes a new header; top-level headers become projects, with the item's text as the project name. If an item begins with a dash and a space (- ), it automatically becomes a task. If an item is neither a project nor a task, it's formatted as a note. If an item ends with the @ symbol followed by a word—for example, @today—the item is tagged with that word as the tag. You use the tab key to make an item a “child” of the previous item; in other words, to create hierarchical lists. In other words, you can compose, format, and manage your lists by simply typing text—you never have to take your fingers off the keyboard. (Bonuses: TaskPaper auto-completes tags as you type, and all but a few of TaskPaper’s menu commands are also accessible via keyboard shortcuts.) If, like me, you’re a keyboard-oriented person, you’ll love the convenience—and freedom—of this approach. 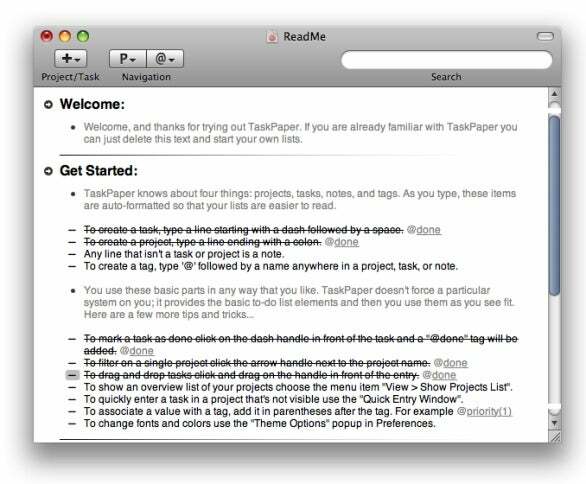 TaskPaper also offers several useful ways to view your lists. By default, all the projects in a document are shown at once. But if you click on the arrow icon in front of a project name, or choose that project’s name from the Project Navigation pop-up, the view shifts to focus on just that project; click on the arrow again to switch back to the default view. Alternatively, if you want to focus on just a single project, Command+click on the project’s name to open it in a new, Safari-like tab within the same window; you can open each project in its own tab, if you like. (Unfortunately, you can’t rearrange tabs as you can tabs in Safari.) Finally, you can reveal TaskPaper’s Projects List, which changes the program’s interface considerably. Instead of showing all projects in a single view, TaskPaper displays only a single project at a time, along with a list of projects on the left-hand side of the window; click on a project name to view it. You can also combine these features: You can view the full list in one tab, while using the Projects List in another. While testing TaskPaper, I found it to be right in my personal “sweet spot” between too basic and too complex. But there’s one other thing about TaskPaper that’s unique: TaskPaper works all this magic using plain text. That’s right: TaskPaper documents are text files, viewable in any text editor or word processor. When you type a colon to designate a project, you really are just adding a colon to the end of a line of text; when you type @done to tag a task as done, you really are just adding the text @done to a line of text. TaskPaper interprets those simple characters to produce the formatted appearance you see on the screen. What this means is that your documents aren’t trapped in a proprietary format that only your task-management program can read. You can transfer a TaskPaper document to another computer, to your phone or PDA, or to any other device that can handle plain-text files, and you’ll have full access to its content. Conversely, you can create and edit task lists in any text editor; as long as you remember TaskPaper’s simple formatting rules, when you open that text file in TaskPaper, it will appear as an attractive project document. Speaking of appearance, TaskPaper’s Preferences dialog lets you choose from among several themes that determine the colors and formatting of your lists, or you can create your own themes (from scratch or based on an existing theme). 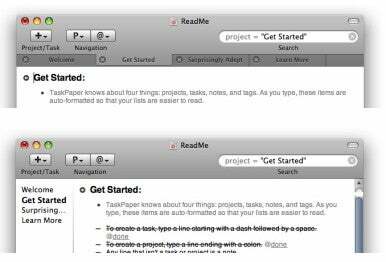 TaskPaper also includes a useful search/filter field that supports advanced queries; a separate Find/Replace feature; a Quick Entry Window for adding tasks to a project even if that project is currently hidden; OS X services support for adding tasks when in another program; and a good AppleScript dictionary. 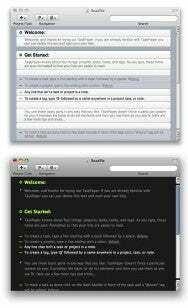 So what doesn’t TaskPaper provide? You don’t get due dates, schedules, or many of the advanced project-management features of programs such as Things or OmniFocus. And while using TaskPaper, my biggest complaint was that it doesn’t have an iPhone version and can’t sync with any other iPhone to-do-list app. But I was continually impressed by its combination of simplicity and flexibility.